The classic collectible card game Deadlands : Doomtown returns as an Expandable Card Game in Doomtown : Reloaded. Featuring four factions fighting for control of Gomorra, California. Doomtown : Reloaded allows you to build your own deck from a fixed set of cards in the box. Play your dudes to control deeds in the town, and use actions, hexes, and more to thwart your ... <lire la suite>. The classic collectible card game Deadlands : Doomtown returns as an Expandable Card Game in Doomtown : Reloaded. Featuring four factions fighting for control of Gomorra, California. 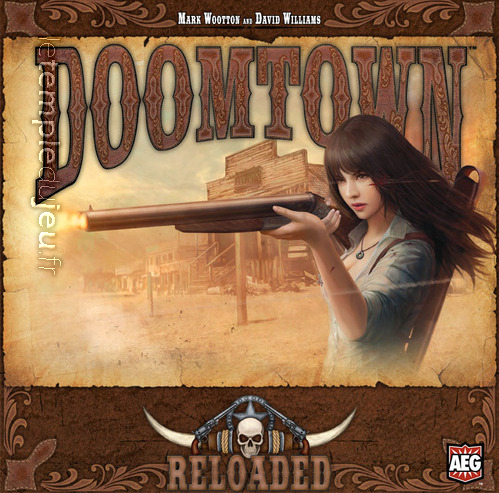 Doomtown : Reloaded allows you to build your own deck from a fixed set of cards in the box. Play your dudes to control deeds in the town, and use actions, hexes, and more to thwart your opponents.